Texas football will play under the lights Saturday, April 21 in the 2018 Orange-White Spring Game presented by Living Spaces at Darrell K Royal-Texas Memorial Stadium. The 6:30 p.m. Orange-White game will follow UT home games in softball against Oklahoma State at 12 p.m. and baseball against New Orleans at 2:30 p.m. Admission to the football spring game is free, and seating is on a first-come, first-served basis. Gates 8, 14, 16 and 25 on the north end of the stadium open at 3:30 p.m. and provide direct access to the pregame "Texas Football On-Field Experience." All other stadium gates open at 4:30 p.m. 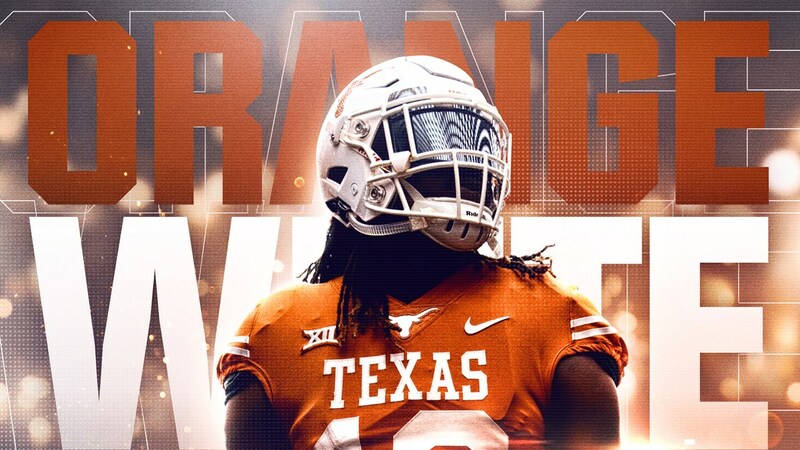 In addition to getting a first look at the 2018 Texas football team, other fan elements have been added to this year's Orange-White Game. More details will be announced prior to April 21. There are plenty of additional interactive activities including inflatables, tailgate games and the opportunity for fans to get their very own portrait created by caricaturists. Enjoy music in the Live Music Capital of the World at DKR-Texas Memorial Stadium before the game with live music on two different stages from 3:30-6 p.m. Concerts take place inside Gate 8 and Gate 25. Stay tuned for artist announcements. The first 10,000 fans in attendance receive a commemorative "Celebrating 125 Years of Texas Football" poster. Following the game, fans can enter the field from inside Gates 14 and 16 on the north end of the stadium. Player autograph sessions will last for 45 minutes; players will be arranged on the field by position groups. Players may sign the official Spring Game commemorative poster only; no outside items may be signed. Coaches are not available for autographs. The clear bag policy is in effect for the Orange-White Spring Game. All bags larger than 4.5 by 6.5 inches, including purses and diaper bags, must be clear plastic and no larger than 12 by 6 by 12 inches. For more details, please visit texassports.com.